FREE SHIPPING in the lower 48 states. Includes: premium vacuum cleaner, powerbrush, Stairpro, powerhose, ITwand, plastic wand, floor brush, sofa brush, dust brush, crevice tool, storage bag. We accept payment with Amex, Discover, MasterCard, PayPal and Visa. You do not require a PayPal account to pay via credit card. Please allow up to 7 business days for delivery. If you are dissatisfied with your purchase, return it to us in the original packaging within 30 days for a full refund. Feel free to contact us via email with any questions. The ZeroG Weightless Vac can agitate and loosen dirt unlike any vacuum cleaner you’ve used before. Try it risk-free for 30 days to see for yourself! 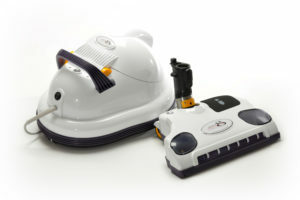 Our proprietary floating vacuum cleaner provides superior cleaning for less. The ZeroG canister floats by using its own exhaust, making your work easier and faster. Our cutting-edge power head is perfect for pet hair and can loosen particles that have been in your carpet for years. Read this amazing review from one of our customers! “I am a very busy work-at-home wife and caretaker for both an elderly husband with Alzheimers and a young golden retriever. I normally would not take the time to sit down and write such a long review of a product: the ZeroG changed all that… and this is why! I was growing tired of being envious of friend’s homes that were immaculate; no fur, no dust, no crumbs… just blissful cleanliness. I would come home to the opposite: dust, fur, crumbs and general dirt. I was sad, I was depressed. I thought, if only my house could be so clean! I purchased my new wonder directly from the manufacturer after some back and forth conversations about warranty, etc. The replies were immediate and taking advantage of Black Friday sale offer, I made the leap to ZeroG and have not regretted a minute! Background: I bought an extremely overpriced Rainbow vacuum about 20 years ago and while it was efficient, it was cumbersome, expensive to maintain and very heavy… very! Dealing with dirty water bowls and regular maintenance sent me on my next journey… Dyson. After three expensive Dyson uprights (and tossing each and every one) I thought I had discovered the perfect vacuum… the upright Shark. Affordable, somewhat lightweight, but was still left with what to do with the stairs, floor moldings, crevices, etc. It still just left my house not quite clean enough. While I thought I would never go back to a canister vac system, I must say ZeroG is the PERFECT solution to all my vacuum needs. LIGHTWEIGHT! I can easily carry it up and down stairs with very little effort. IT FLOATS! It just glides around on hardwood AND carpet and never gets stuck behind a chair leg or base cabinet. ATTACHMENTS! Galore! Have been able to easily switch from one to the other… telescoping poles are invaluable to reach high corners and in between and under appliances. STAIRS! The best! The motorized attachments get every crumb and hair. OUTDOORS! Tackled both front and back porches with nozzle and extended tubing. Goodbye cobwebs and brick dust! ENJOYMENT! I mean, really, who can really say they enjoy vacuuming? ME! I find it to be one of my favorite things to do in my ‘off time’ of other duties. The feeling of accomplishment goes a long way in making for a happy life. Crazy, right? Convinced? Click to buy now!